The Mount Horeb Area Historical Society held its annual membership meeting at the Driftless Historium History Center. Following the business meeting, the featured program took the stage. This year, MHAHS partnered with the Friends of Stewart Park to highlight the natural, cultural, and literary legacy of the Driftless Area that both organizations serve and call home. Conservation biologist and writer Curt Meine and Savanna Institute Executive Director Keefe Keeley shared the story behind their work as co-editors of The Driftless Reader, published in 2017 by the University of Wisconsin Press. The Driftless Reader is a wide-ranging collection of texts and images about and from the Driftless Area. It includes selections from such well-known writers as Black Hawk, Mark Twain, Laura Ingalls Wilder, and Frank Lloyd Wright, as well as other Native Americans, explorers, scientists, historians, farmers, songwriters, journalists, and poets. Paintings, photographs, maps, and other images complement the texts, providing a deeper appreciation of this region’s layered natural and human history. The book is available at our gift shop in the museum. Festive Photo Booth -Holiday Portraits for a Good Cause! Capture your Christmas card photo, or just a special holiday snapshot to share with loved ones! Pose in a gorgeous vintage, fully restored cutter sleigh, against a festive outdoor-themed backdrop and obligatory pile of brightly wrapped presents. Other fun props will be optional, including an oversize teddy bear and "Santa's bag of toys." Presented by Trivent Financial, Benefitting the Driftless Historium and The Norsk. Guest Speaker: Sharon Murray, Historian and Northern Virginia's Antietam National Park interpretive Guide on Wisconsin's Iron Brigade. The Annual Membership Meeting was held at the Mount Horeb Senior Center. Over 60 people attended to hear an overview of the successes of the past year by Director Destinee Udelhoven and Curator Johnna Buysse, as well as the featured (and timely) presentation by past President and Society co-founder Brian Bigler entitled, "Unraveling the Mysteries of the Norway Building of the 1893 World's Fair." Meet our new Executive Director Destinee Udelhoven. Destinee has a M.A (American History and Museum Studies) from the University of North Carolina at Greensboro, a B.A. (History, with minors in English and Studio Art) from Black Hills State University. Destinee has experience in several history-related arenas, including archaeological work with the US Forest Service and Old Salem Museum & Gardens (Winston-Salem, NC), and has held positions as Archivist and Curator of Collections and Programming, as well as most recently serving as the Director of the Historic Indian Agency House (Portage, WI). Husband, Wade (a native of Platteville), and two children (Max and Mia) reside with Destinee in Mount Horeb. After 86 years Little Norway has closed. We received many of their artifacts directly from the owners and from a large monetary donation. Willi Lehman -Bleu Mont Cheese Co.
Wine, Beer and Cheese festival to announce our new Cheese Factory website including an interactive map and listings by township with links to their webpages. The festival featured several cheese makers with local ties along with sampling of their cheeses. We also had samples of local beers and wine. Comments on this event from the Cheese Underground blog and from the Wisconsin State Journal. The Evjue Foundation, the charitable arm of The Capital Times, awarded a grant of $5,000 toward the general support of the Society's work. Madison Community Foundation encourages, facilitates and manages long-term philanthropy. "Life and Change at the Edge of the Driftless"
This multi-faceted exhibit, the centerpiece of the Mount Horeb Area Historical Society's new 3-building, 12,000 square foot facility, shares the many stories of the ecologically and geologically unique Driftless Area of Southwestern Dane County -from the last Ice Age to today - using original artifacts and documents, as well as video, photo slideshow and interactive kiosk elements. A partnership with the Little Eagle Arts Foundation of Wisconsin Dells, with support provided by the Ho-Chunk Nation, added additional cultural dimension, via demonstrations and displays of traditional crafts and arts by Wisconsin tribal members, many of whom will also offer their art work for sale. ​Elliott Funmaker, Sr. and family conducted a cultural demonstration of Ho-Chunk Nation traditions at the Driftless Historium in Mount Horeb. They shared their rich heritage with many details about the regalia that they wear, as well as the significant meaning of the songs and dances. They also explained the symbolism of objects and actions, such the drum itself and the beat they played on it. It was an informative peek into the culture of the native people of this Driftless Area. One that will helps ensure their traditional heritage is not soon forgotten. #1 Writing the Driftless Landscape: Catherine Young's essays and poems have been published nationally and internationally in numerous literary journals and in anthologies, including "The Driftless Reader." #2 Stories in the Soup Pot: Using food as inspiration, writing instructor and naturalist Catherine Young will lead exercises and prompts for you to craft delectable written creations. We'll cook up and serve stories from our own lives which may take shape as memoir, fiction, poetry or even children's literature. Rooney’s bold, lively colors and semi-abstract, nature-inspired landscapes are fresh, modern and engaging. Rooney began painting in earnest in 2008, under the mentorship of local artist Peg Ginsburg—but art has always been a quiet presence in his life. Rooney’s residency at the Driftless Historium is rendered even more poignant by the fact that his great-great-great-uncle was Ebenezer Brigham, Dane County’s first permanent settler, with a robust presence in Wisconsin’s early history. In fact, Jonathan honored his family heritage by sponsoring the new “Brigham’s Inn” exhibit! Inga had us in the palm of her cream cheese-spattered hand today--with at least one audience member heading right to the grocery store afterwards to pick up ingredients for their own smorgastrata. A big THANK YOU to Inga for visting the Driftless Historium today and all who attended--and, of course, to Lora Lee for setting the Scandinavian mood beforehand with her hardanger fiddle! We hope to have Inga back with us Around the Farm Table very soon. For more pictures see our Facebook page on this event. Dec. 2017: Festive Photo Booth- Holiday Portraits for a Good Cause! Holiday photo shoot at the new Driftless Historium, with all proceeds benefiting future children's programming. Capture your Christmas card photo, or just a special holiday snapshot to share with loved ones--for a good cause! Pose in a gorgeous vintage, fully restored cutter sleigh, against a festive outdoor-themed backdrop and obligatory pile of brightly wrapped presents. Other fun props will be optional, including an oversize teddy bear and "Santa's bag of toys." Sept. 2017: Student Research Symposium & Exhibit Reception. UW-Madison students, under the leadership of Art History and Material Cultural Professor Ann Smart Martin, partnered with the Mount Horeb Area Historical Society on this exhibit -a collaboration that offered new perspectives and posited intriguing larger-world connections. 2 of 4. Local Artist Demonstrations & Children’s Activity Station. 3 of 4. Local Artist Demonstrations & Children’s Activity Station. Local Artist Demonstrations & Children’s Activity Station. 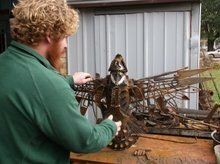 ​John Pahias (of Center Ground Studios) will demonstrate the art of mixed metal sculpture. ​Rachel Monaco-Wilcox will present “Human Trafficking in Wisconsin"
Office Corey Saffold, law enforcement professional in Madison discussed his experiences as a Black policeman. Grand Opening of Wisconsin’s newest cultural destination, the Driftless Historium. Ground Breaking Ceremony at Grundahl Park. ​Check out this great video by UW-Madison's student marketing organization, Mu Kappa Tau. Thanks MKT! It is an excellent overview of The Driftless Historium project and the related Final Challenge capital campaign. ​Mount Horeb Area Historical Society Board member Shirley Martin (left) accepts a $25,000 check from UW Provisions’ Jim Kalscheur (right), the third installment of the Kalscheur Family Foundation’s $100,000 pledge to the Southwestern Dane County Heritage Center capital campaign. Kalscheur kicked off the Society’s capital campaign as the first pledge toward the proposed facility. Join Kalscheur by sending in your 2014 pledge now. The Madison Community Foundation awarded a grant for $25,000 to the Southwestern Dane County Heritage Center Capital Campaign (renamed the Driftless Historium). The Heritage Center will be a 16,000 square foot interactive, cultural hub in downtown Mount Horeb. Native American Flute-making Workshop. A unique cultural experience led by a knowledgeable Ho-Chunk instructor, held in a charming venue. Only 12 students accepted. The monthly events for children covered a wide variety of themes. 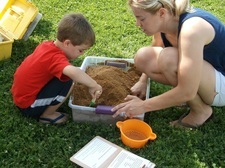 MHAHS hosted an "Dig Into History", an outdoor, drop-by interactive event designed to introduce kids to the concepts of archaeology. This also happened to be the same weekend of Mount Horeb Area Chamber of Commerce's annual and popular Art Fair, and we were happy to add a bit more variety to the day's cultural offerings. We were happy to include an informational booth on the archaeological investigations at nearby Donald Park provided by the Friends of Donal Park, a live demonstration by experienced flint knapper Gary Eldred and a "what's in my archaeology bag" tutorial by MHAHS President and actual archaeologist, Tony Zalucha. Close to 100 budding archaeologists and their guardians stopped by before a bout of scary weather closed us up early at 1:15pm. But we plan to be back next year, so see you then! MHAHS hosts Civil War Camp for Kids. 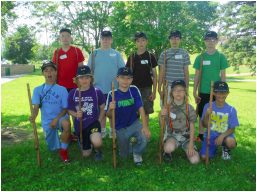 30 young recruits, ages 8 to 12, from across the area signed up for a full day of marching in formation and military drills, a signal flag activity, soap "whittling," a lunch of genuine hard tack and beef jerky, and more! Astonishing Tales! *, a compendium of collected and never-before-published musings on the amazing aspects that present themselves within the context of everyday life. Geiger, who has a degree in philosophy, operates from the premise presented by Jorge Luis Borges, who says that the thing philosophers really seek, more than truth, more even than knowledge, is the opportunity to be amazed. His montage of personal stories documents this wide-eyed perspective on his own Neanderthal DNA, death, the holidays, dandelion, doppelgangers and much more. Mount Horeb High School Art Show. Dozens of works of art in a variety of mediums all by Mount Horeb High School students were displayed in the Kalscheur Family Foundation Community Education Room. Stewart Park Geology & Its Impact on Prehistory. Summer 2017. What Does the Geology of Stewart Lake Park have to do with Native American Settlement Patterns and Stone Tool-Making Methods in the Upper Sugar River Watershed? A View from the Heights of Mount Horeb. Art Walk. Summer 2017. Reception and Raffle to follow at the Driftless Historium. ​Free to all! Join us for the first Mount Horeb Art Walk, featuring 13 local artists at various Downtown businesses from 5-8 pm. Get your "Passport" signed by all of the artist on the map and get entered into a Raffle. Drawing will be held at the Driftless Historium from 8-9pm. Pick up your Art Walk Passport from any participating businesses, the Chamber of Commerce, or the Driftless Historium. MHAHS and Mount Horeb Landmarks Foundation co-host a Chamber Social at the charming Old District #1 Schoolhouse. A 1970's theme celebrated our Society's 40th anniversary of preserving and sharing the area's history. MHAHS and Cave of the Mounds National Natural Landmark co-host "Then & Now" event in celebration of the Cave's 75th Anniversary as a tourist destination in the Cave Barn. A panel of former tour guides and people with family connections to the Cave's story were interviewed, with a slideshow of historic and modern photos and a "show and tell" of memorabilia also featured. MHAHS arranges for Watertown, WI's renowned 1st Brigade Band to perform an entertaining and edifying free community concert, with original Civil War tunes, played on genuine Civil War-era instruments, by talented musicians in Civil War-era garb. An uncertain weather forecast meant a change in venue to the accommodating Mount Horeb High School Auditorium. Close to 200 attend. 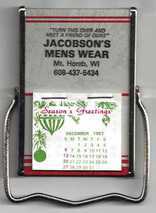 "Barbers and Beauticians" new exhibit at the Mount Horeb Chamber of Commerce Welcome Center. Open from 9:00 am to 4:00 pm weekdays and 10:00 am to 1:00 pm weekends. Scandihoovian Winter Festival: Annual celebration at Mount Horeb Area Museum. ​2017 event: "1-2-3 Ski-Doo": We presented an exhibit of classic 1970 snowmobiles and clothing at our museum. 2018 events included: Free apple cider and more. Book illustrator talk and Historium Cupcake Walk. Join downtown Mount Horeb businesses for a Art and Chocolate Walk. Visit 10 local businesses who will be hosting a variety of Artist from around the area. And for the sweet tooth out there select location there will be offering chocolate. Visit all 10 locations and fill up your passport to be entered into a raffle drawing.